I’m Tony – and this is my wife Freya. As you can see we like to Goth it up a bit from time to time! 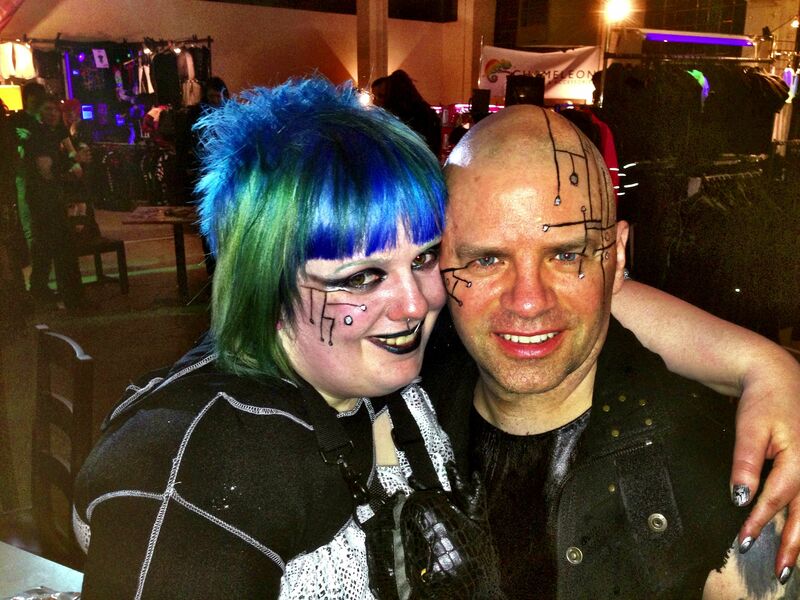 This was taken at Resistanz 2013 – a 3 day Goth/EBM festival in Sheffield. We don’t usually look like this – but it is very rare to find a picture of both of us – so this one will have to do! We do pretty much everything together and are never apart. We mix up our socks and wear one each. Sometimes we do the same with shoes – that looks weird! I love to cook. Freya loves to eat what I cook. So basically – I cook – we eat. I have a lot of cookery books. Way too many. 300+ I reckon. I promised Freya that I would make something once a week from any new cookery books I bought – so I did. In 2012 Freya bought a Dutch Barge – and it was a mess. It needed ripping back to the metal and refitting. 2 years on we are almost ready to move onto it. But, boats are smaller than houses so where on earth am I going to put all my cookery books? We resolved that I would de-spine, guillotine, scan, PDF and store all my cookery books and – along the way – make food week on week from each book that I de-spine. So far I’ve stripped maybe 40 books, and now I’m blogging about the food I make. Recently we’ve been trying to eat a lot healthier. I’m no spring chicken and Freya wants me to look after myself. Freya wants me to get her healthier too. We decided to try out vegetarian cooking in November 2013 in an attempt to get Freya’s mum to eat a more varied selection of vegetarian food. Doesn’t mean we are vegetarian, just that we only cook vegetarian at home. My routine is generally that I pick up a cookbook at the weekend – find 10 dishes I want to make (2 per day) – and then make them the following week. This generally works and we have a good lunch for work – and a nice evening meal. I hope you enjoy my reviews of recipes I find in my cookery books! Will do – thanks for the wake up call!